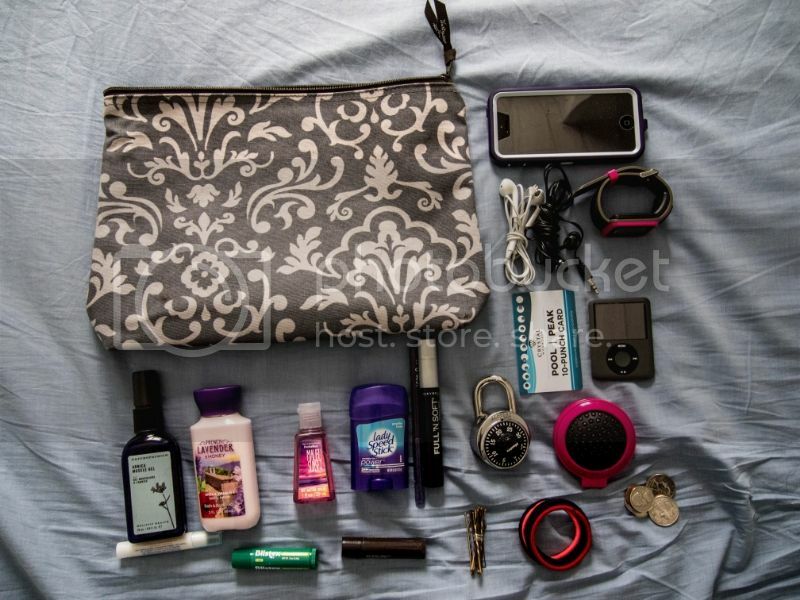 I admit it, I love all those "what's in my bag!" posts folks do. I think I like them because they remind me that no, I'm not alone in carrying all the stuff with me. Sometimes totally necessary. Sometimes totally random. I thought I'd share with you all what goes with me to the gym. I am bag obsessed. I feel one can never own enough bags. 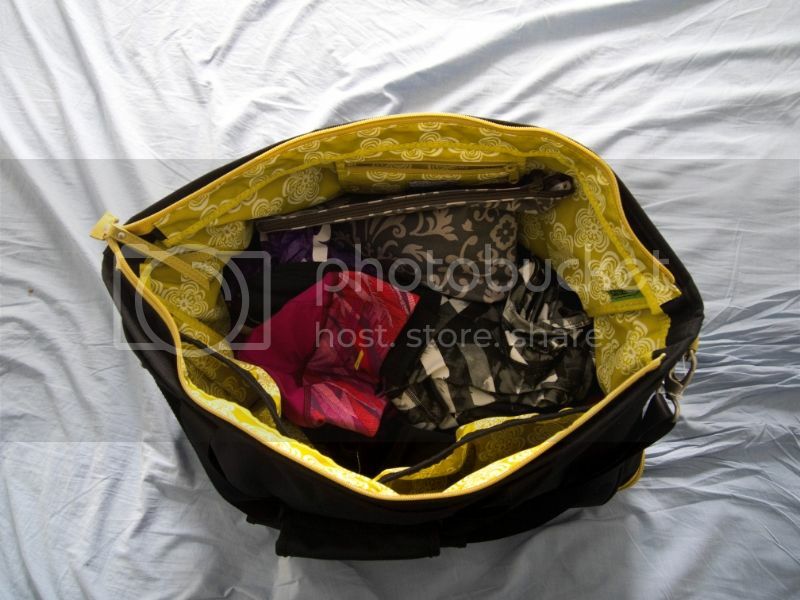 You just never know what kind of bag you are going to need for any potential occasion or event that might pop up. One must always be prepared. Anywho, I am currently using a bag from Haiku. I absolutely adore this line of bags and when I was able to scoop one up for myself (hello discount and gift certificate!) I didn't hesitate. 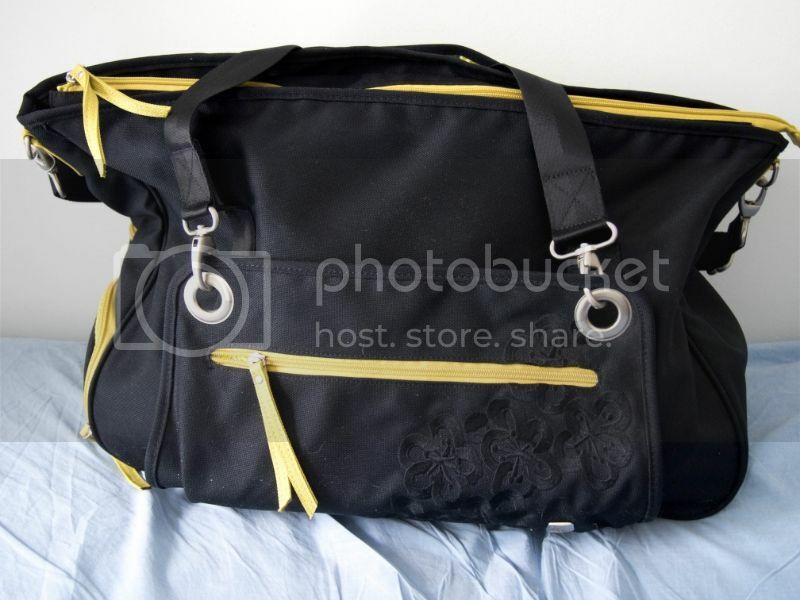 I picked up the Weekender bag, which is kind of like the Tardis. It's a lot bigger on the inside than it looks on the outside. To be honest, it's almost too big BUT is actually perfect. Because I hit the gym immediately after work, I need somewhere to stash all my work clothes which can be kind of a lot here in the winter (layers people, so damn many layers). I dig it though. It holds everything I need, with room to spare. AND there is a separate section for your shoes which is a huge bonus. Drew would tease me all the time about my obsession with all things pink. Which is funny because I don't actually like the color pink. I just own a lot of "pink" things. It's weird. I always have a long sleeve shirt of some sort to wear after my workouts. Right now, this pink one (I don't get it) is my favorite. I picked it up for like $6 at KMart and it's perfect to throw on before bundling up in my winter jacket. As for my shoes, I LOVE my Merrell's. This is one of 10 pair of running shoes from them that I own. These are by far my favorites, All Out Rush. Super comfortable and fit like a glove. I like to have options when it comes to what I wear during a workout. I adore Old Navy's compression pants and have yet to find another brand that fit me as well as these do. I always have two pair of leggings (full length and cropped) and a few tops to choose from. 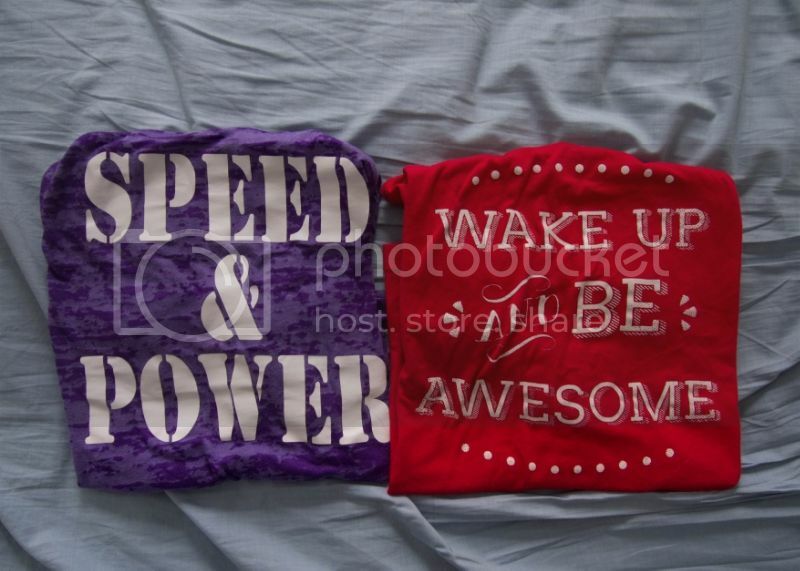 These two are my favorite: the purple one I had custom made (an inside joke with Drew) and the red one is from The Fitness Tee Co on Etsy. They have lots of fun tanks and tees. I own way more of them than I really need to. I bought this zipper pouch from a friend who sells Thirty One bags. It's the perfect size to carry around everything else I need with me at the gym as well as for the cold walk to the car when I'm done working out. iPhone (I need my jams), headphones, TomTom Runner Watch (I'll be doing a post on this watch within the next week or two), iPod Nano (in case my iPhone dies, I dunno why I have it with me), class punch card, folding brush, loose change, hair ties (can never have too many), bobby pins (again, never enough! ), padlock, mascara & eyeliner, deodorant, hand sanitizer, lotion, arnica gel (the best thing EVER for sore muscles) and multiple things of chapstick. Hat, buff, headband, and gloves. --I do tend to layer my tanks when I work out. I don't know why I do it, but my favorite tanks to do so with are from Next Level. They come in lots of fun colors and are relatively inexpensive. --CamelBak Water Bottle: I always have one with me for optimal hydration during gym session. There you have it! 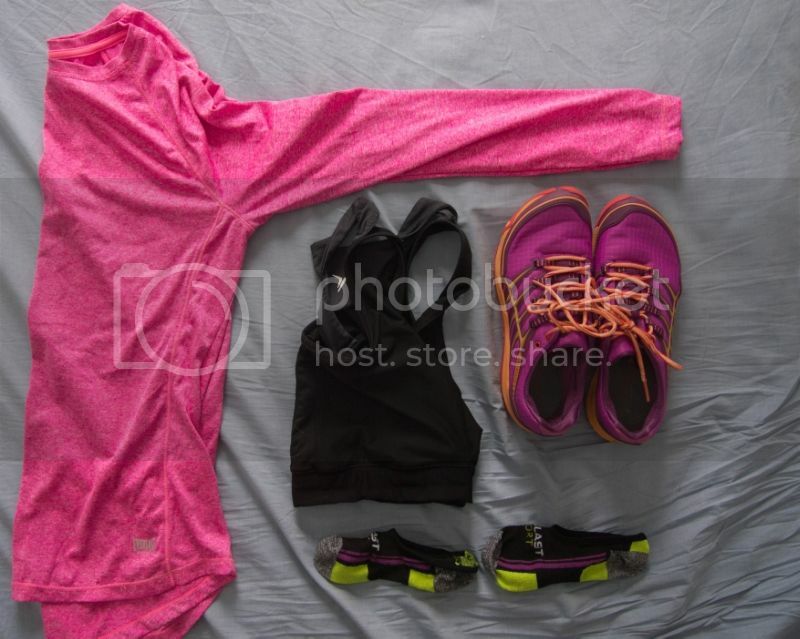 Everything I haul with me to and from the gym, which sometimes feels like a workout all in itself! What is something you can't live without when you hit the gym?